Everlong Paint is rebranding to a new name - Sarah Jayne Chalk Paint. We're also delighted to announce that there's no change to the non-waxing paint formula that we all know and love. As the first non-waxing chalk paint to revolutionise the UK market, Everlong Chalk Paint is an exciting innovation in the chalk paint world and has had great success in the UK market. 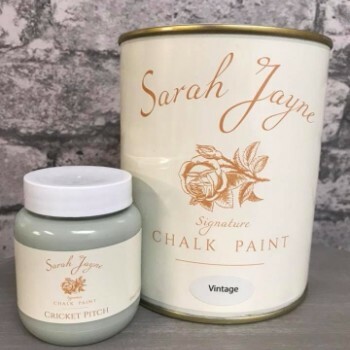 Sarah Jayne Chalk Paint needs no wax finish, has a smooth surface, no chalky bits and is a delight to paint with. The paint is environmentally friendly, safe to use on children's toys, has virtually no smell and is safe to use indoors. With a fast drying time and a gorgeous palette of 31 colours to choose from, you will soon discover why Sarah Jayne Chalk Paint is what everyone is talking about. With no prior sanding, no smell, no harsh chemicals and most importantly, no waxing, you can paint with confidence knowing you will have a professional finish and your very own masterpiece in no time at all. It's versatile enough to be used on most surfaces including wood, metal, ceramics, stone, glass and fabrics. Claire's CraftHouse is a national stockist of Everlong Paint and we're excited to continue our wholehearted support to its founder, Sarah, and her fabulous team, in its reincarnation as Sarah Jayne Chalk Paint. As the new brand is rolled out over the coming weeks, you'll begin to see changes to the look of the tins and other products in our online chalk paint shop and at the Claire's CraftHouse store in Lichfield as we bring everything into line with the new brand. If you have any questions about the new Sarah Jayne Chalk Paint range, please contact the Claire's CraftHouse team on 01543 483520 or email hello@clairescrafthouse.co.uk.